Booking a hotel across the street from The Flying Saucer was either brilliant or foolish, depending on the time of day. Nashville in June can be mistaken for Baltimore in August (at least when we were there). I can never hear Roll On by The Little Willies too many times. The Loveless Cafe has biscuits to die for. I’ve never been gifted in the biscuit making department. I end up with dough that’s either too sticky or too dry and biscuits that are either too gummy or too dense. But those biscuits at the Loveless? Those biscuits were heaven on earth. Light and fluffy, I’d swear the secret ingredient was an airy cloud folded into the dough. They come to the table still warm from the kitchen and butter starts melting at the sight of them. Those women in the Loveless kitchen know their biscuits. Pair them up with some Loveless fried chicken or sawmill gravy and you’ve got some serious southern eats. Our life here in Charm City sees few biscuits. Which is why when they do make an appearance, SFC gets very curious. What sort of occasion could be on hand to warrant the risk of offending the biscuit gods? I blame it on my sister. She was visiting from Georgia with her kids. Since I hardly ever see her, I didn’t want what little bit of time we had together to be eaten up by me standing in the kitchen. So I outsourced a ham, mixed up a batch of Deb’s Broccoli Slaw, and dug into the recipe folder for a biscuit that I hoped would not leave me shamed. Because down in Georgia, they know good biscuits just as well as they do in Tennessee. Good old Molly at Orangette did not let me down. When I read that she had paired these very same biscuits with ham and Honeycup Mustard, I knew it was a sign that I was destined for success because that’s exactly what we were having. There was a moment of uncertainty when I had to work more flour into the too sticky dough. I’d been down that road before and it usually didn’t end well. But I pressed on and by the time my sister arrived there was a plate of nearly perfect biscuits to be devoured. Between the three adults, we put away eight of them. And the last two only survived because I had set them aside for later. So the next time The Mistah pulls out his “Got Biscuits?” tshirt, maybe I’ll mix up a batch of these…no special occasion necessary. In a large bowl, whisk together flour, brown sugar, baking powder, salt, and baking soda. With a pastry blender or two knives, cut in chilled butter until mixture resembles coarse meal. Whisk together chilled sweet potato purée and buttermilk in a small bowl and stir that quickly into flour mixture until combined but not overmixed. Turn out dough onto a lightly floured surface and very gently knead a few times until dough comes together but is still slightly lumpy. If your dough is too sticky, work in up to 1/4 cup additional flour. Shape into a disk,and pat to an even 1-inch thickness. Flour a 2-inch biscuit cutter and cut out biscuits as close together as possible. Gather scraps together and repeat to cut out more biscuits. Do not reuse scraps more than once. Preheat oven to 425 degrees, with rack on lower shelf. Butter or spray an 8-inch cake pan and arrange biscuits snugly in the pan. 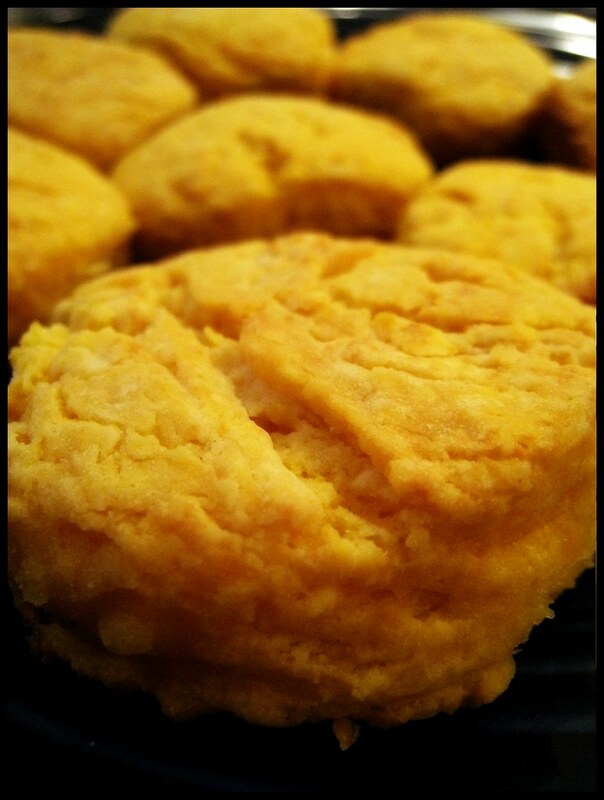 Brush biscuits with 1/2 tablespoon melted butter and bake for 20 to 24 minutes, until golden brown, rotating the pan once. Yield: 8 to 10 biscuits. I love biscuits. I think I might have to make a batch soon. Growing up we used to put butter and jam on them, hot or cold. It’s one of those things my mom would just whip up without a recipe at a moments notice. Great comfort food. My husband refuses to eat a naked biscuit. Butter, jam, he does it up. Okay. It may be heresy, but Harris Teeter sells frozen biscuits that are pretty darned near homemade in quality. Mary B’s is the brand name–red and white bag in the frozen food section. I served them with some butter and homemade strawberry jam and noone believed I didn’t make them. If it’s too easy then we’d eat them all the time. But I’ll file that bit of info away because you know when it might come in handy.